Don’t we all dream of the perfect loft apartment? Rooms flooded with light, brick walls, concrete floors... the full package of urban romanticism? Admittedly there aren’t many apartments which satisfy all these requirements. 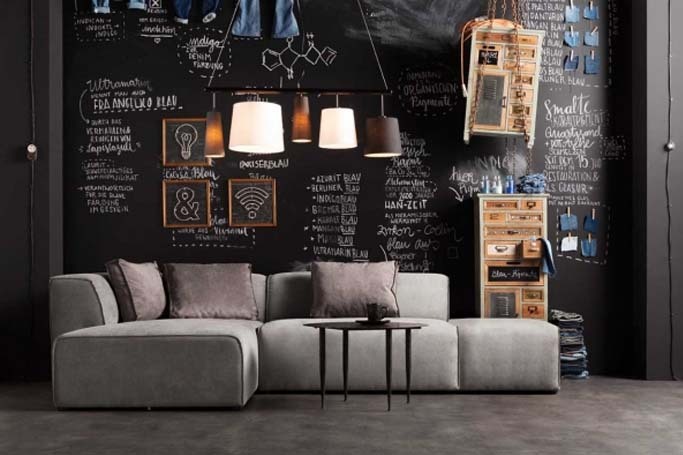 We have the perfect collection for lovers of the industrial furnishing style who don’t want to invest a fortune, but are looking for special eye-catchers in spite of this. X-Factory represents a mixture of the concrete look and fronts made of solid fir wood, while the legs are positioned at an angle in the mid-century style and connected with decorative cross struts. Full of character and yet not obtrusive, solo or in a group, the collection has immediate and direct appeal. This is how you can create an industrial loft style at little expense. Pictures: the principle of ‘less is more’ also applies when it comes to decorating the wall! But of course it can be in XL format. Why not something completely out of the ordinary? Hanging a bike on the wall not only represents theft-proof storage but also makes an interesting change. And our top tip: isolated large pictures on the wall make the room look larger than is the case with a collection of small images. The same applies to mirrors: a large mirror makes the room look bigger, regardless of whether it’s a spacious loft or an apartment with industrial style furnishings. Try it for yourself! For more information on how to give your apartment a loft vibe, contact the KARE showroom in Oud Metha at 04-6097555 or visit their website here.